Antonin Guillot. The American Camp at Allerey (1918-1919). 1999. Allerey in 1918. 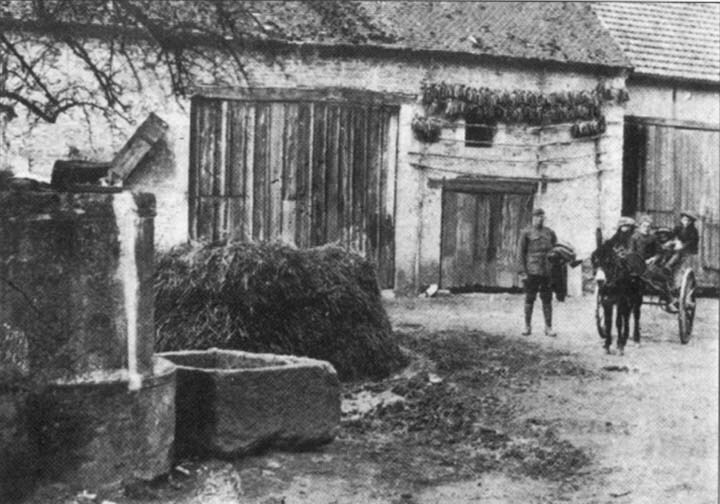 Allerey, 1918. 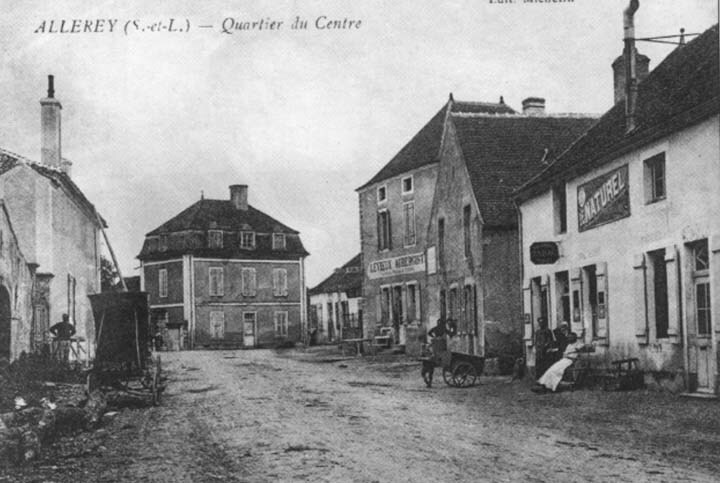 Town square and the route to Verdun. Center of town, Route to Beaune and Pussey. Allerey, 1918. Girls' School, (constructed in 1906). Allerey is a town in the cantonal district of Verdun-sur-Doubs, situated in the northeast sector of the département of Saône-et-Loire, near the Côte d'Or. To the east, the Saône, a fine, navigable river, separates it from the town of Verdun, cantonal administrative headquarters. 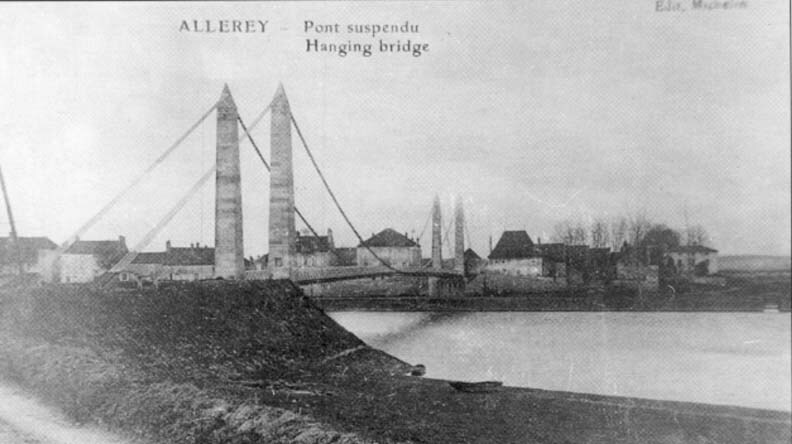 Less than 4 km of road and a suspension bridge over the Saône allow for easy access between Allerey and Verdun, through the hamlet of Chauvort. The large settlement of Gergy is but 4 km away on the road leading to Chalon-sur-Saône, administrative center for the département, at a distance of some twenty kilometers. Allerey is not isolated, as it is crossed by National Highway 470, connecting Beaune to Verdun and the Jura region, and by Departmental Road 5 which leads to Chalon. 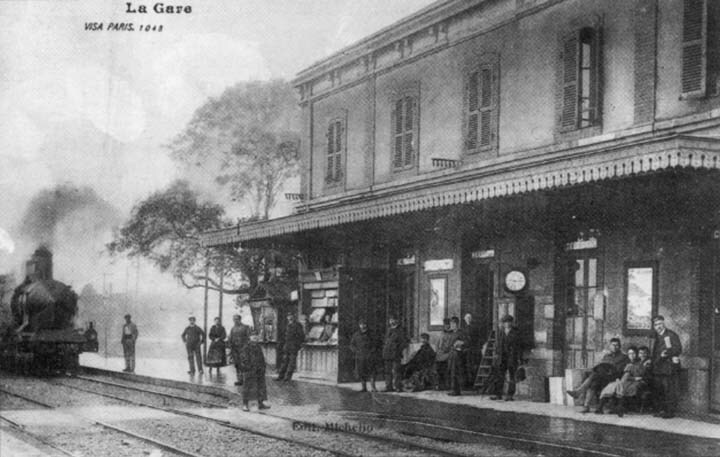 At the same time, it's a railroad hub of strategic importance where the railway lines of Chalon-sur-Saône to Gray cross those of Chagny to Dôle (with a sideline from Saint-Loup-de-la-Salle to Beaune). These lines were obviously widely used during the First World War. The inhabitants are divided between the town and the three hamlets of Chauvort, Pussey and Baignant. Essentially a rural community, it stretches out over 1,642 hectares, including arable land, prairies, woods and a few vineyards. A variety of crops are raised (grains, corn, potatoes, beets...) and a number of different animals (milch cows, goats, horses, pigs...). 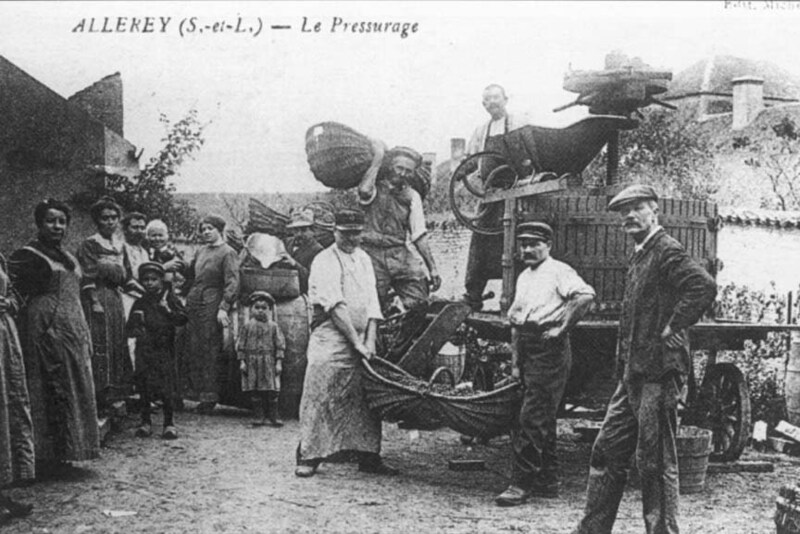 On the eve of the war, the population (938 inhabitants in the census of 1911), although occupied most of all with farmwork, also included some thirty crafts- and tradesmen (including five innkeepers, three bakers, four grocers, four masons, two furniture-makers, two wheelwrights, two wooden shoe makers, etc...), as well as employees of the railroad, a mailman, men or women teachers (two public schools [one for boys and the other for girls], a private girls' school). 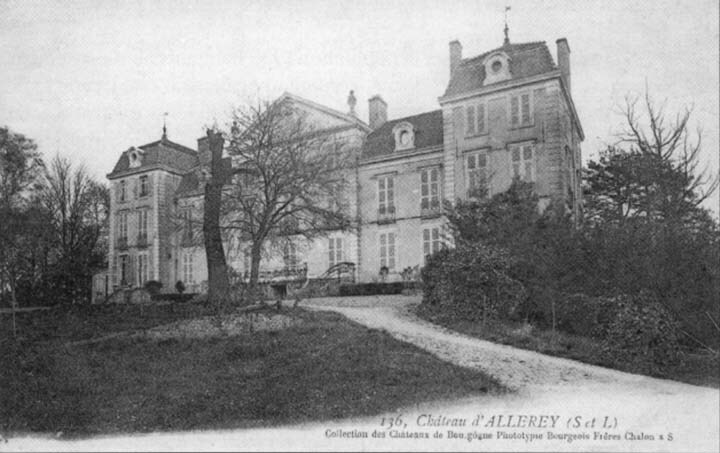 Allerey has a church and a château, both built in the 18th century. After the mayor, Mr. Albert Galland, elected in 1912, died, Mr. Amédée Guillemard, first assisstant, took over until December 10, 1919 when Mr. Antoine Truchot was elected to the post. 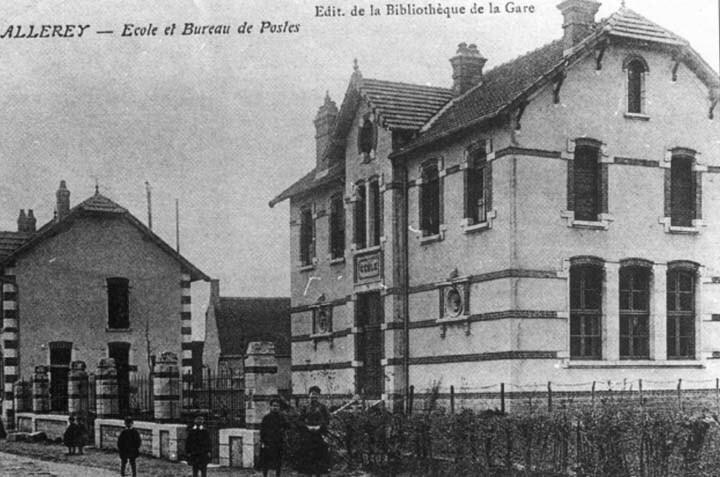 The public school for boys was directed by Mr. Blanc (who was drafted) and that for girls by Miss Maire (re: 1922). Abbey Javelot was the parish curate (and was drafted as a medic). The local mailman was Mr. Lécuelle. In 1918, most of the healthy men were drafted and sent to the front or rear. Here, as elsewhere, the rural populations paid a heavy tribute for the defense of their country. In less than four years, from 1914 to 1917, 25 men between 21 and 36, did not come back, not to mention the wounded, mutilated, gassed or prisoners (8 others died in 1918 and another in 1919). 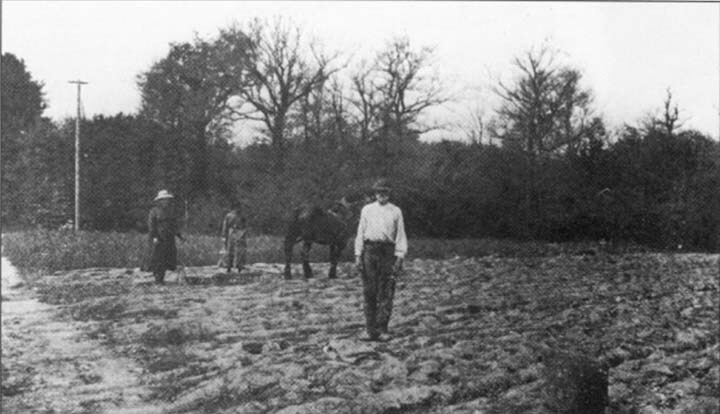 Until that time, the work in the fields was carried out as well as could be. Women, adolescents, and the few elderly or undrafted men tried to assure the subsistence of the village families and the supplies which a nation at war needs. Tradesmen and crafsmen worked in slow motion, given the restrictions on many products. In most families, the wait for news from the front, fatigue or sadness held sway. Hope nonetheless was rekindled by the American intervention decided in 1917 to give a hand to the French and Allied armies who were almost worn out, but months passed before any American soldiers took part in combat. It is in this context that, at the beginning of the year 1918, an extraordinary bit of news reached this modest village of Allerey: the imminent construction of a vast American hospital-camp in the township. 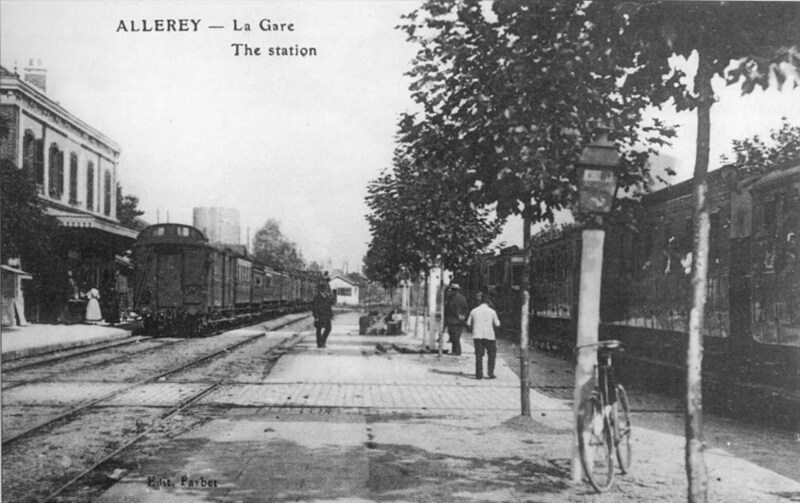 Allerey, 1918. 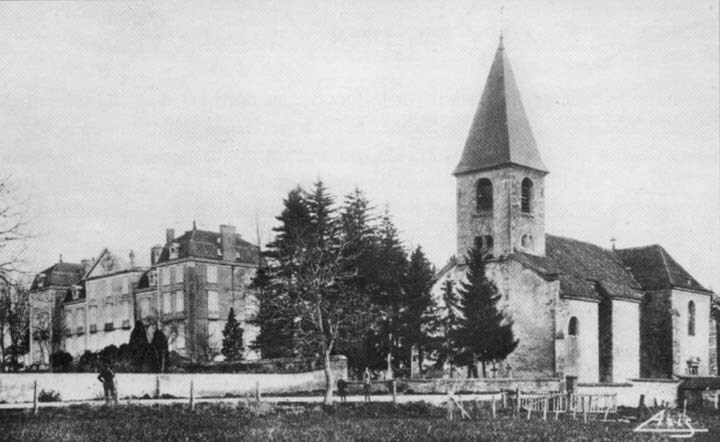 The church and the château. Allerey, 1918. The château (XVIIIth century). Allerey, 1918. La station, the newspaper kiosk. Allerey, 1918. View of Allerey from the route to Chauvort. Allerey, 1918. 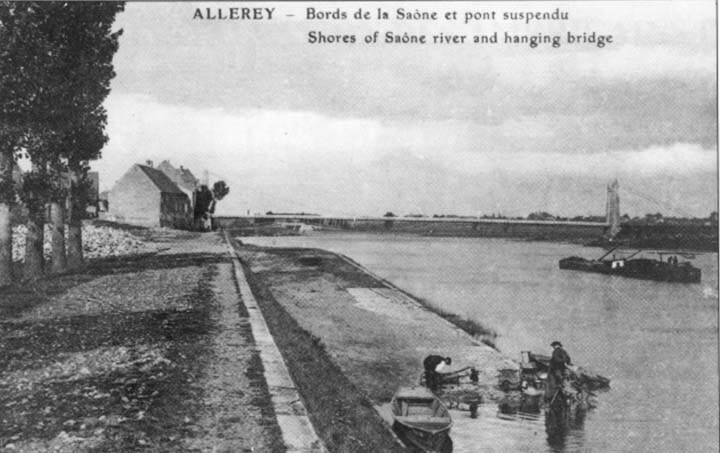 Banks of the Saône, suspension bridge and washerwomen at Chauvort. Allerey, 1918. Suspension bridge at Chauvort : view from upstream, left bank. Allerey, 1918. Barnyard (American soldier and children). Allerey, 1918. Fieldwork (two women help a man whose two sons were killed in the war). 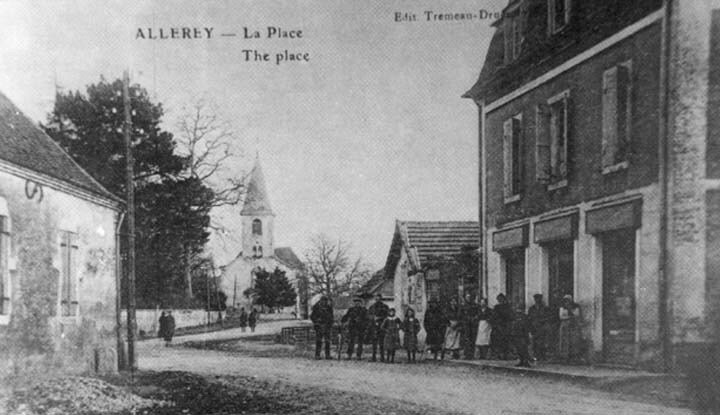 Allerey, 1918. The mailman helps with the pressing.